My family always has a big ol’ jar of pickles in our fridge. At all times, whenever we need a salty snack only a pickle can satisfy, we can go into the fridge and grab one. Needless to say, we have gone through quite a few pickle jars through the years. Instead of simply throwing away these pickle jars, use them to make something spectacular. I know, it sounds crazy, but trust me, if used right, pickle jars make awesome rustic accents for your home. For example, cleaning a pickle jar and removing the lid makes a great rustic vase for plants of any kind. You can also decorate the jars with anything you’d like: paint, writing, stickers, and more. You can also use these jars for organization of bulk items: food like beans or coffee, makeup brushes, or anything you’d like on display. You can also use it for candles! I used a smaller pickle jar to display some sand and sea shells, giving my bathroom a beachy vibe. Anything you can do with a mason jar, you can do with a pickle jar. Give a pickle jar DIY a try, like Instagram user marys_hobby_life has. 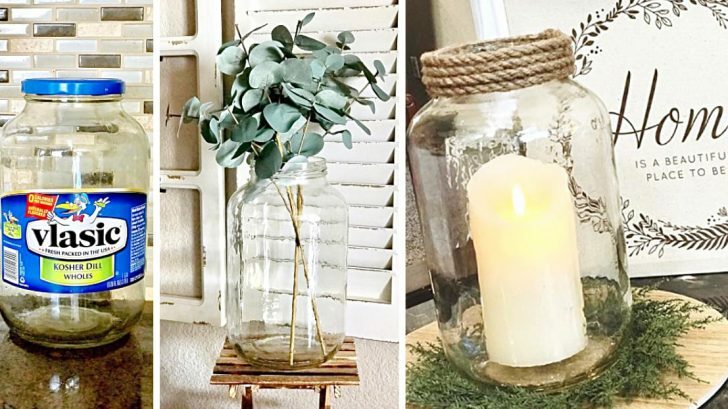 It’s really breathtaking what these jars can turn into, and you’ll want to use pickle jars for a ton of DIY decor. Weddings, home decor, and so much more can be decorated with one of these babies. You’re just one jar of pickles away.